Redefine appeal and practicality with distinguished seating options from the Durham Collection that feature stylish elliptical arms and popular slat bench seats with rolled-edge. Built ready for an array of application utilizing a commercial steel construction, ultra-resilient powder-coated finish, Durham Collection offers lasting performance, aesthetics and durability. 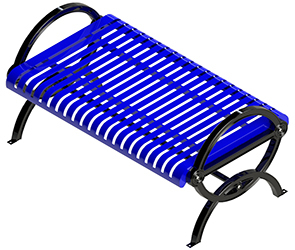 Engineered with footings accommodating portable and surface mount installations, 4' and 6' bench lengths are available.